Book lovers, teachers, and students rejoice: iBooks has come to the Mac--and it supports iBooks Author books, too. Apple Senior Vice President Craig Federighi previewed the new Mac version of iBooks to a cheering audience at Monday's Worldwide Developers Conference keynote, alongside other improvements in the upcoming OS X Mavericks. iBooks for Mac includes all the features users have come to expect in the iBooks app on iOS, including full access to the iBookstore and your iCloud-synced user library. The bookshelves of iOS 6 are gone, leaving simple rows of cover titles in your library. Once you open a book, you're presented briefly with the cover before your text is revealed. Once inside, you can bring your book to full screen, add bookmarks, search through the book, change the text size and font, switch to Night Mode, add highlights and notes, and study using study cards. 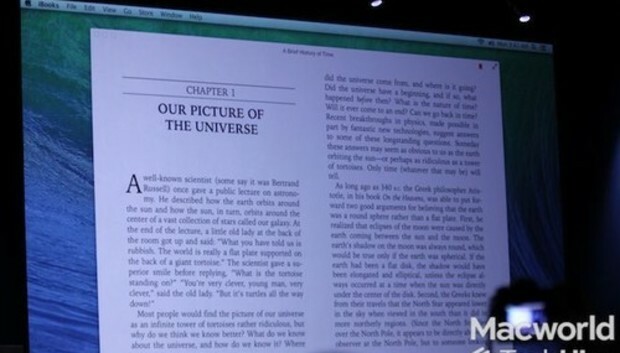 In addition, iBooks for Mac, like its iPad cousin, lets you read iBooks Author-created books directly on your Mac (to the joy of teachers and students everywhere). iBooks for Mac supports all features present in iBooks Author books on the iPad. While Federighi didn't say so explicitly, it's likely iBooks for Mac will arrive bundled as part of OS X Mavericks when it arrives this fall. Developers, meanwhile, can see a sneak peek in a preview released today on the Apple Developer portal.